If you’ve always dreamed of a straighter and more beautiful smile, but don’t want to spend years wearing braces, then Invisalign®Go may be the perfect solution for you. Invisalign®Go uses a system of clear aligners to help patients gradually, yet effectively, move their teeth into more desired positions. Invisalign®Go is designed to treat aesthetic conditions involving the front 10 teeth (top and bottom). 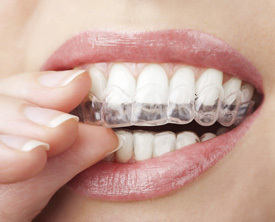 Invisalign®Go aligners are made from a clear, lightweight material. They’re almost invisible! At Albany Place Dental Practice, our state of the art scanner will be used to scan your teeth in order to make customised aligners. No more fussing about with impressions and moulds! Aligners will be changed every fortnight. A set of aligners will be given at the first appointment and review appointments will be made every 6 weeks. Will Invisalign®Go Work for You? The dentist together with the Invisalign®Go system will decide whether you will fit the criteria to obtain a more beautiful, healthy looking smile. Along with the fact that these clear aligners can correct common aesthetic conditions, they also pose a number of other benefits for patients, especially when compared to traditional metal braces. Prior to commencing treatment, patients are able to see their desired results on-screen, helping them to visualise how their teeth will move during treatment. Additionally, because the aligners don’t contain metal wires or brackets, they are more comfortable to wear and require less time spent in the dentist’s chair. Aligners are worn all day except whilst eating, brushing and flossing, making it much easier to clean compared to traditional braces. A maximum of 20 aligners are required, each aligner to be worn for 2 weeks. You can have straighter looking teeth in under 10 months! There are enough challenges for today’s teenagers without having to worry about how their smile looks. With Invisalign®Go, no metal brackets or wires will show that your teen is straightening their teeth, and they won’t have to worry about many of the concerns that traditional braces involve. In addition to being unsightly, traditional braces won’t allow you to eat foods like apples and popcorn. They can be challenging to keep clean, too. With Invisalign®Go, you can remove your aligners when you need to, making them easy to maintain and allowing you to eat as you wish. With treatment times averaging up to two times faster than traditional braces, your teen will be showing off a perfectly aligned smile in no time. Our current promotion means consultation for Invisalign®Go is free- yes FREE! That is $200 waived of your orthodontic treatment! We will take scans and photos and show you a customised view of how your teeth will move into a more ideal alignment, all at no cost to you. Come in and speak to our lovely dentist Dr Disha Jethwa who will guide you through the process to obtain the beautiful smile you deserve!